Pingdom’s new public reports (a.k.a. status pages) now support custom domains. 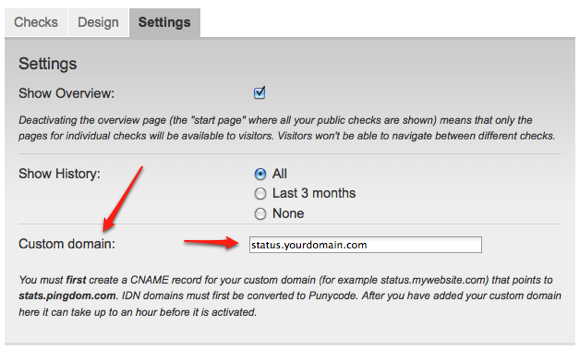 Normally your public report pages show up under the stats.pingdom.com domain when you activate them, but now you can set up your own custom domain for them, for example status.mywebsite.com. Needless to say, you can only do this for domain names you actually own and have control over, for example the domain name of your website. First add a CNAME record to your DNS zone that points your custom domain name to stats.pingdom.com. Above: Partial screenshot from the Pingdom control panel: Public report->Settings. That’s all you need to do. The only thing to keep in mind is that it might take up to an hour before the custom domain starts working on our end. Your status pages will still be hosted by Pingdom if you use a custom domain, so they will keep working even if your own website is down (provided your DNS servers aren’t all down as well). Make it match: Since you can also customize the look of the public report (some examples here), you can make its colors match that of your regular website, and you can add your own logo as well. This pushed me over the edge to finally upgrade from the free account. Great job! I would really like to see further customisation features made available; maybe the ability to add a short paragraph of text, or add a custom link back to the user’s main site. Also I found myself wanting to change the order of the checks rather than having them alphabetically, but that is neither here nor there. The ability for you to be able to add some form of notes/comments to your public reports is definitely something we’ve been thinking about and would like to implement once we’ve gone through some other things. We currently don’t have an ETA for when we’ll add it, though. The other suggestions here are also good, and we do have a big internal list of upcoming features that we think you’ll really like. On another note, if I have an HSTS domain with a wildcard certificate, can I still use a custom domain? I.e. can https://status.mywebsite.com/ point to the stats page? Or will it only work with http? I’ve set it all up and it doesn’t seem to be working, but maybe I just need to be more patient! I just setup a status page on a sub domain, and it is very cool! Like some of the others, I would love it if I could customize things some more, like the main page title, which now reads “Pingdom Public Reports Overview”. It would also be great if I could put a link on the pages, for example to direct people to a Twitter account where I could publish updates in case of an incident. But let me stress that I greatly enjoy this new feature! @Eric: Thanks for the feedback! Glad you like it. We will definitely add more features to the public reports / status pages, including much of what you mention. I like the new stat,it’s really a cool design and useful. By the way,I find that currently most servers are in America and EU,will you plan to set up servers in Asia(HK,Singapore etc) as Internet is boosting there too? @liciece: We’ll expand our monitoring network into those areas, but not not quite yet. It’s definitely coming, though. There’s one thing missing: a meta refresh header so I can stick it up on a screen in the office and it’ll show the latest statuses, without me having to log in. Agreed! I suppose you could put it in a frame and reload the frame – doesn’t help when your server (that holds the frame) goes down of course!